Wrath Of The Ages #5 - Final act: return of the Autobot hero! Wrath Of The Ages #6 - Optimus Prime versus Megatron! Transformers: Seeds Of Deception presents the third act of Wrath Of The Ages #6. Art by Daniele "danbrenus" Spezzani, Eleonora, Nicodemus Rexx,, Zerob, Brandy Dixon, OrangeFigure. 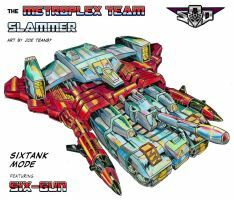 the Bios and Tech Files for Scamper, Slammer and Six-Guns, the three Curators of Metroplex. The secrets of the so-called Metroplex Team are finally out: does Six-Guns have an actual alt mode? What is a Transmogrification Drive? Can Slammer trasform into a robot? What are a SixCar, a SixTank and a SixWing? Metroplex alone is a a wonder by himself: a Transformer large enough to turn into a city that can host other Cybertronians. How advanced and complex must be the technology behind his existence? And what sort of effect does it have on those that are bound to live within the boundaries of Metroplex' world-like body? 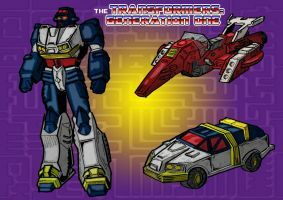 Transformers: Seeds Of Deception presents the [url=href="http://m3gr1ml0ck.deviantart.com/gallery/55483862/Devious-Folder]Obscure G1 Transformers art gallery[/url], starting with the character studies for Action Master Axer. Before becoming an Action Masters, Axer had a Cybertronian alt-mode, revealed here for the first time! And how did his transformable motorbike look like, before being reformated as a Earth vehicle? 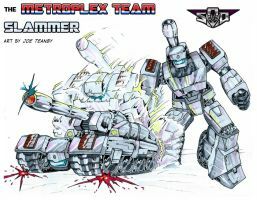 Check out the commentary section with hints of the online comic that will feature Axer and Metroplex! By Gianluca Gamba, Navtej Heer, Franco Villa. SoD Metroplex: the cover to "A Tale of Two City-Bots"
Transformers: Seeds Of Deception presents the cover of A Tale of Two City-Bots. It's the weight of the world for Metroplex, in a tribute to Guido Guidi's artwork for the <b>Armada</b> comics! Transformers: Seeds Of Deception presents A Tale of Two City-Bots in PDF format. 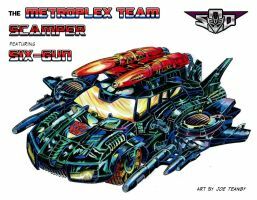 The whole SoD Metroplex saga is now collected in one easy-to-download PDF file, featuring a Spotlight-themed intro and bonus art for Full-Tilt, Brunt, Scamper, Slammer and Six-Gun. Long before the Civil War. Before the Golden Age. Even before the Prime Dynasty...there were the Lawless Times. An age without rules, where only the strong and the ruthless would thrive. An age where creatures undreamed of walked the scarred, tormented surface of Cybertron. Monsters, giants, celestials, abominations... and Titans. Transformers: Seeds Of Deception presents act IV of Starscream: "The Gladiator". Starscream has climbed the social ladder, becoming a very popular Cybertronian officer of law: everybody appreciates him, his teammates would die for him, and every corrupted businessmech on Cybertron wants to make deal with him. For Starscream, of course, this is NOT ENOUGH! Witness as Starscreams steps in the path of the Gladiator, and begins to worm his way inside the Underground Movement and the Gladiatorial Arenas...until the day Civil War erupts, and his true nemesis is revealed! Transformers: Seeds Of Deception presents an all-Decepticon triple feature! 1. Cover "Dark Apotheosis" of SoD: Trannis, featuring Megatron. 2. Cover "Into The Arena" of SoD: Starscream. 3. 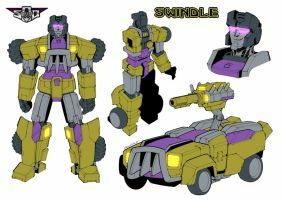 Swindle's "War Within" model sheet. Transformers: Seeds Of Deception presents act III of Starscream: "ATLEA". It's the beginning of the Golden Age! Young Starscream is back on Cybertron, as a respected member of the Anti-Technoabuse Law Enforcement Agency. Really? Is he truly standing for the rights of other mechs? Featuring G2 Snipe, Technobot Lightspeed, Aerialbot Skydive, Triggercon Windsweeper and some unexpected G2 foes, this act is more than meets the eye! Also featured, industrial businessmechs Ratbat and Scorponok, plus some RotorForce and Laser Rod bots! Art by Lee Ji Hyun, Sin-nos. SoD Shockwave/Soundwave: the Omega Battle! Transformers: Seeds Of Deception presents pages 16-18 of SoD Shockwave/Soundwave. It's the very beggining of the Civil War! With Omega Supreme taken out of the equation by a two-pronged assault, the Omega Sentinels cannot rise to defend the Cybertronian Citistates against the overwhelming Decepticon Insurgence! Transformers: Seeds Of Deception presents the end Wrath Of The Ages #6. It's now or never! What is happening to Grimlock? Will the damaged Optimus Prime manage to withstand the fury of Megatron? Will Flash' race be doomed by the hands of Carnivac and Spinister? And what can stop the unstoppable Aerial Extermination Drones? Everything comes crashing together in the great finale of this untold Age Of Wrath! Art by Daniele "danbrenus" Spezzani, Nicodemus Rexx, Esther Pimentel, Zerob, Hedge, OGE, Lauren Mays. Seeds Of Deception presents Differentiation (Act 2): Manipulation. Ratbat is back in style, continuing to develop the untold events of The Future is -Ation. With Megatron out of the game, The mind-controlling, energon-sucking diminutive Decepticon is ready to ignite his own plans for the control of Earth...starting with the manipulation of the elite soldiers of an unnamed special forces unit that came to investigate the site of the battle against the Reapers. Bonus art: Captain Ackles and Colonel Williamson. The lives of Shockwave and Soundwave take an all different turn, as they fail/succeed to accomplish their main goals. And untold events of Omega Supreme's brush with death are revealed for the first time. SoD Shockwave/Soundwave: cover "Target: Omega!" Transformers: Seeds Of Deception presents cover "Targer: Omega!" of SoD Shockwave/Soundwave. Art by Joe Teanby and Charlotte. Transformers: Seeds Of Deception presents "The Transmogrification Occurrence" (1). Deemed too unstable to be deployed in battle, the gigantic Metroplex is being confined in an uninhabited solar system, where his trusted team (Scamper, Slammer, Six-Gun) takes care of his huge spaceship alt-mode, performing maintenance, experimenting on fringe cyberinterface technologies...and facing unscheduled threats by a lone Decepticon bounty hunter! By Joe Teanby, Krin, Lizolb. With the Dead Universe defeated, Optimus Prime and the Autobots return to their everyday cold war against the Decepticon... but the crisis is far from over! By using the Magnificence power, Hot Rod started an irreversible universal change: when mechanoids, persons and planets begin to morph into alternate versions of themselves, who will stand up to prevent reality becoming a jumbled chaos that will ultimately self-destruct? Daniele Spezzani, Kal, Trunchbull, Megumi M..
3,826 pages were recently viewed by 749 unique visitors. This page was viewed 1 times on Friday, April 26th 2019 8:47am CDT. © 2019 Seibertron, Inc. DBA Seibertron.com. All Rights Reserved. Established June 2000. Seibertron.com is owned by Ryan Yzquierdo.